It's a promising sign that even after the plaudits the USMNT rightfully received for their unexpected run in Brazil, Jürgen Klinsmann still has both eyes fixed on the real reason he was brought in: To make the U.S. a true contender. In a recent Facebook post, Klinsmann says for that to happen, MLS has to get better. We get benchmarked at the World Cup and there is definitely stuff we have to improve and get better in. It's many things off the field and many things on the field. Playing at that kind of a tempo, at that kind of a rhythm every four days – this has to become the norm. So our job as coaches is how can we make it clear that in order to get further and further we need to add the work load, we need to add the competition level, we need to make them understand what recovery time means, what their life off the field plays a role in many things you can achieve in your career. We have to continue to communicate that, to show them and especially start to implement that with our Under-17, Under-18, Under-20, Under-21, which will be the future Olympic team because that's the next Generation that's going to break in. The more we get that message to those kids, the more we will benefit a couple of years from now. When you go out in the Round of 16, clearly it gives you the message you have a lot of work still ahead of you. Klinsmann has a history of trying to nudge MLS into closer resembling the top European leagues. Right when he got the job, he pushed for a 10- or 11-month season instead of MLS's current 7- to 8-month campaign, and one aspect of the whole Landon Donovan kerfuffle involved him taking shots at the league's quality: "[Donovan] was playing at 70 percent, 80 percent, and he was still dominant." 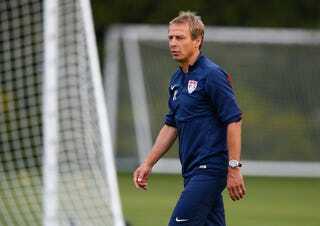 The parts about tempo, rhythm, and playing every four days is another point Klinsmann repeatedly makes, which is the need for players tested in the world's top leagues and in the Champions League. For example, the vast majority of players that will take the pitch in the World Cup semifinal and beyond played in the Champions League this past season, while only Jermaine Jones and Julian Green on the USMNT can claim that distinction. If the first part of his statement criticizes where American soccer is today, the second part is where he will look for his desired improvements. In case it wasn't clear from his decisions to leave home Donovan and chide our domestic league mere days after a team full of MLS players took Belgium to the brink in the Round of 16, Klinsmann won't stand for anyone resting on their laurels. His message to the next generation: I want you to be great, but you're going to have to work for it.